A young dancer from Ireland has failed to mask his disappointment, having been paired with a rather surprising entrant for the next series of ‘Dancing With The Stars’. Dessie ‘Desmond’ Hennessy (61), from north Mayo, hence the unusual spelling of his name (though spelled ‘Dessie’, it’s actually pronounced ‘Steve’), has battled for almost three years through a series of auditions to get to the televised rounds of the enormously popular TV series, where a dancer gets to perform with someone reasonably famous. Speaking with The Heraldy Press, Mr. Mulgrew (he’d changed his name by the time we started this paragraph) said; ‘When I saw the possibilities for this season’s show, I was excited to say the least, I mean, I could’ve wound up dancing with Alanis Morrisette, Tom Selleck, one of the lads that did the voices for popular ’80s kids show ‘Fraggle Rock’, or the tall man from the ‘Police Academy’ films. To end up with that b****cks, Kim Jong-Un, probably my least favorite of all the recent dictators, is a bitter disappointment to say the least’. In what has proved to be one of the most unpopular decisions that the show’s producers have come up with in recent years, this season’s episodes are to feature political figures from around the world paired with members of the dancing public. Already, one contestant, Harry ‘Harry’ Svenson from Connecticut has withdrawn from the show, as he disagreed with his partner, Iceland’s Minister for Agriculture Jim O’Dwyer’s controversial views on goat-herding, while another episode featured a cat-fight between Lorraine Pearson, a cosmetologist from Wisconsin, and her partner Jimmy ‘Jim’ Pederson, Oslo’s deputy lady-mayor, when one said the other had a massive arse. 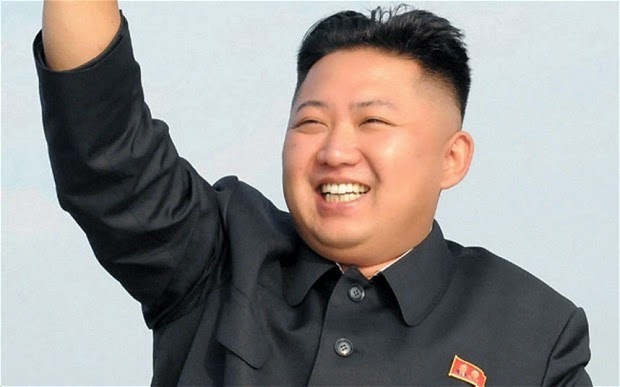 The North Korean leader meanwhile, not particularly well-known for his dance moves, nor renowned for his friendliness or interest in dancing-themed reality shows from the western hemisphere, has insisted that his scenes be filmed either inside his home in the Democratic People’s Republic of Korea, or in a field behind his uncle Maurice’s pub in County Clare. We tried to contact his office for an official statement with regards to the show, but our there was no way we’d spend nearly four dollars for an international call just to speak to him, sure look at the state of him. ‘Dancing with the Stars – Season 96′ will begin filming tomorrow morning. The DVD, featuring outtakes and bloopers, including one hilarious scene where a lad can be seen reading Shania Twain’s autobiography, and another which shows two lads from Wexford drunkenly dancing to no music ‘for the craic’, will be released in a few years. Probably. Ha ha ha you are a total nutter, I’d pay to see that!